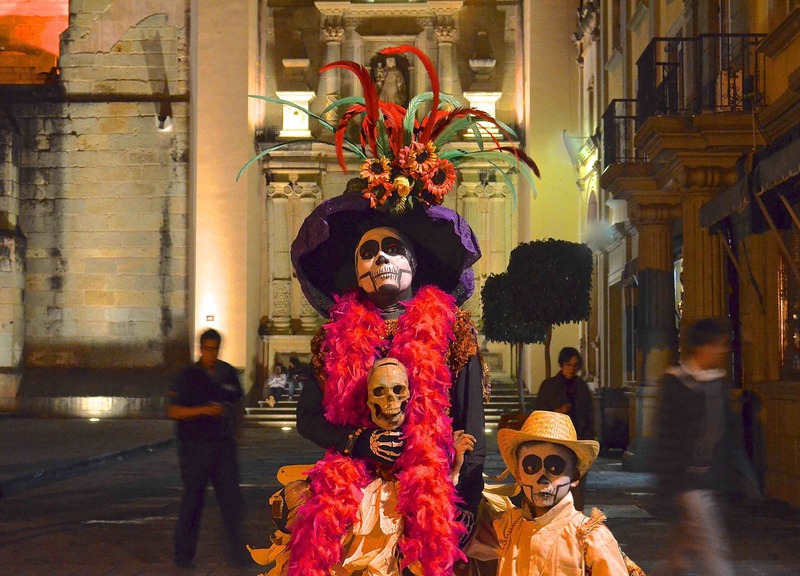 Helene has wanted to visit Oaxaca and see Day of the Dead since 2004 when a photographer friend told her how she loved this beautiful city. Helene says, “In the interim, I have held a Day of the Dead party complete with elaborate altar since 2005. Now it was time to experience it in person. I happened upon this workshop which was a perfect fit for me — hands on intensive learning in an intimate group environment with a wonderfully patient teacher Bill Bamberger, and experienced cultural navigator Norma Hawthorne.” Helene made it easy on me: She provided all the captions! Here are her best of the week. 1. Azucenas restaurant in San Martin Tilcajete. 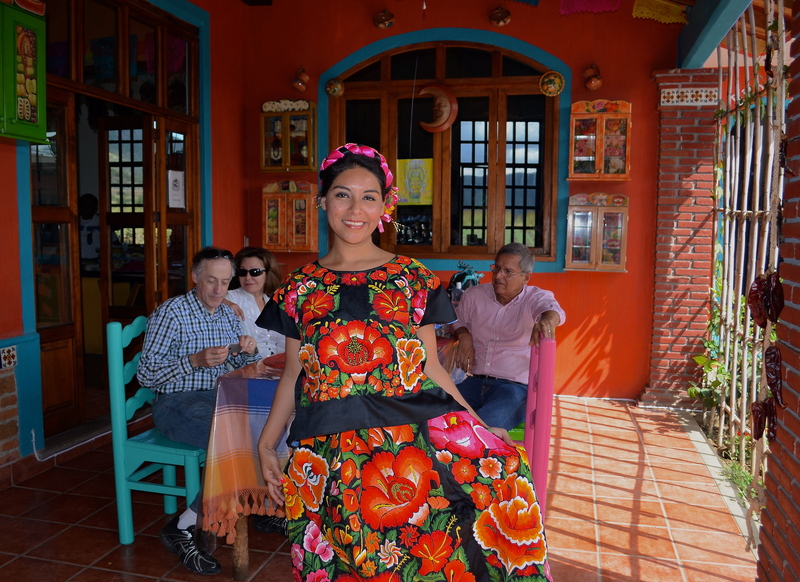 Deby Thompson and I visited here and Ocotlan, where we saw artist Rodolfo Morales‘ house, bought alebrijes, had lunch here — the beautiful hostess happily posed for me in her colorful dress. I loved the play of light and shadow. 2. 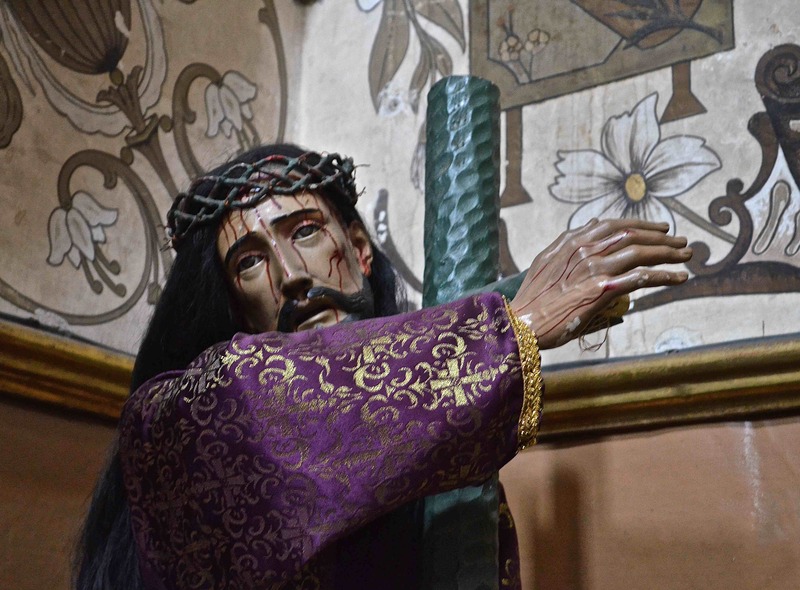 Polychrome figure of Christ on the Cross at San Felipe Neri Church. Attending Catholic grade and high schools I loved looking at these lifelike statues and am fascinated by the ones in Spain and Mexico. 3. 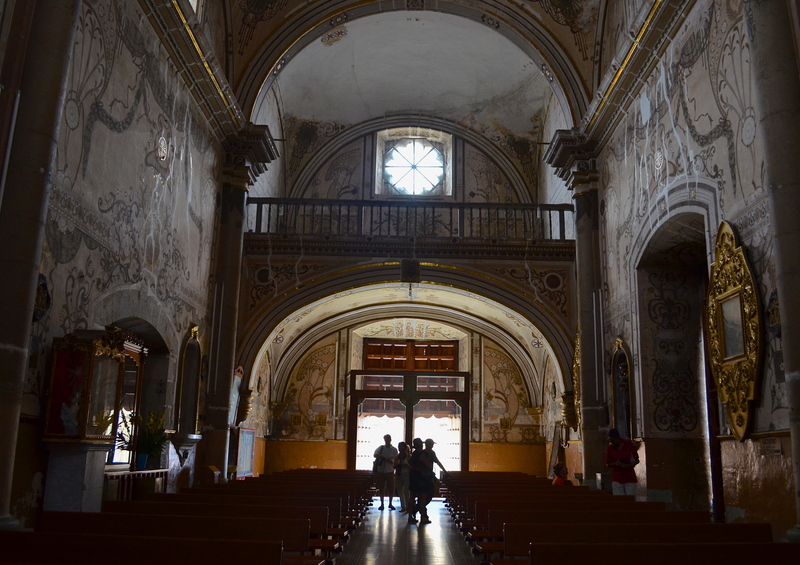 Interior, San Felipe Neri Church. 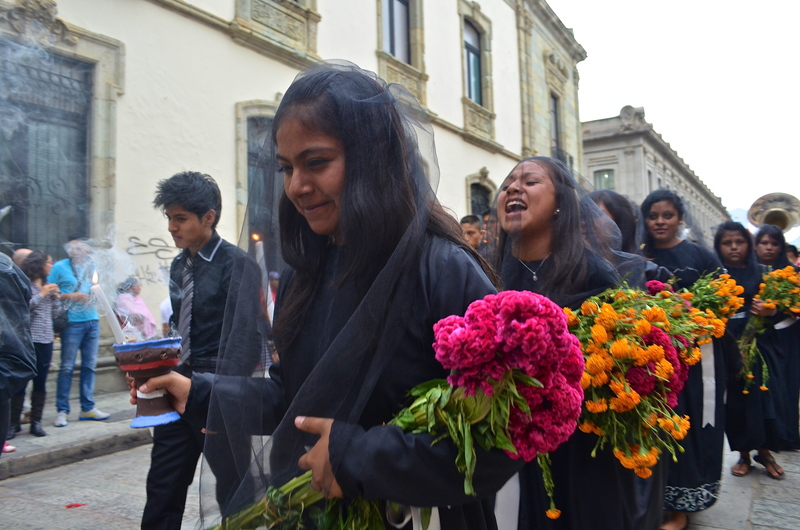 Shooting without flash is de rigeur in the many churches in Oaxaca. It allows you to appreciate the beauty of the painted walls and gilt icons. 4. Above Left: Seeing the many comparsas was one of my favorite things about Oaxaca and due to the location of our hotel we could hear the music in the distance, grab our cameras and go! This might be my favorite shot because the girl in the front is trying to be serious and the friend behind her can’t help herself and breaks into a laugh. 5. Above Right: My second favorite, again multiple emotions here, serious and curious. 6. 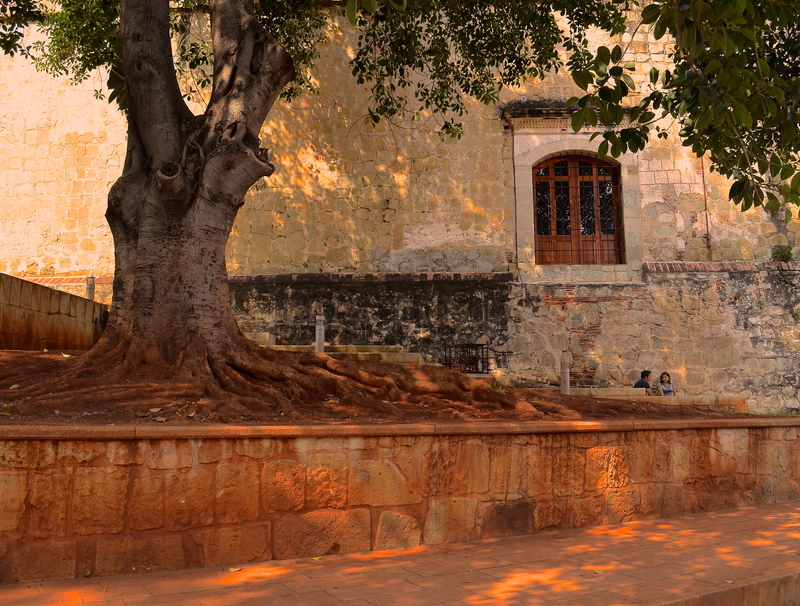 Above Left: The colors of the Santo Domingo‘s worn western facade, stone walls red with earth, couple in the background showing how enormous this ancient tree is, play of light and shadow – captured on a casual stroll on my way to a mezcal tasting. 7. 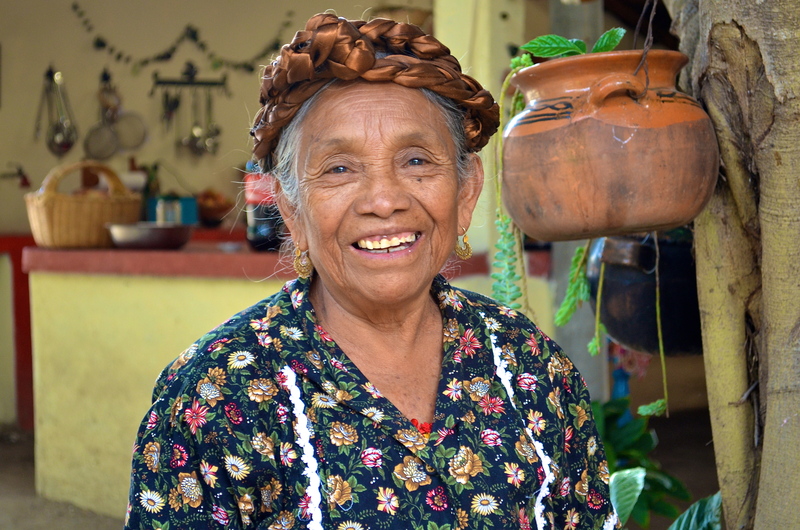 Above Right: I got the shy grandmother of our host family in Teotitlan del Valle to look directly at the camera and smile by telling her she was beautiful, which she was. 8. 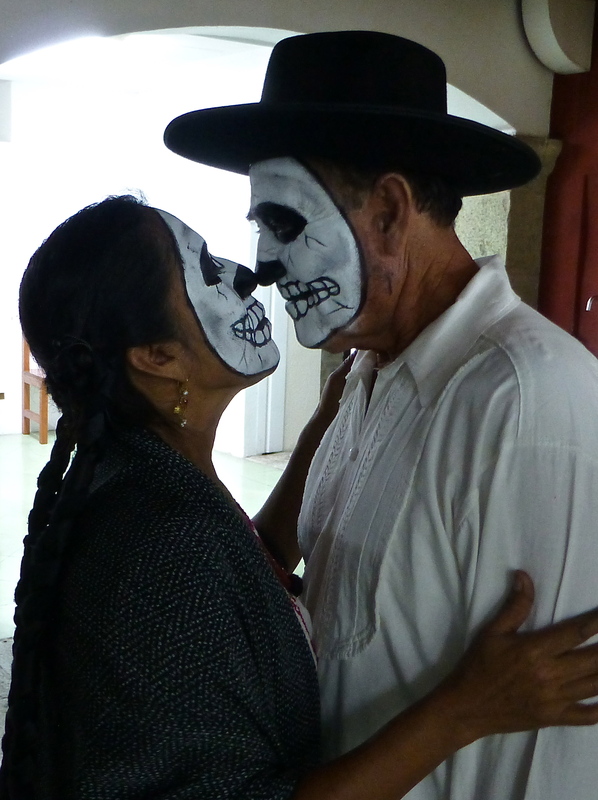 Loved this Catrina who posed on the Zocolo, the way she is in focus while shadowy figures move around her. Norma took us out for a night shooting on tripod practice which was a tremendous help in preparing for shooting at the cemeteries. I was just beginning to shoot using aperture. No more automatic and depending on flash! 9. 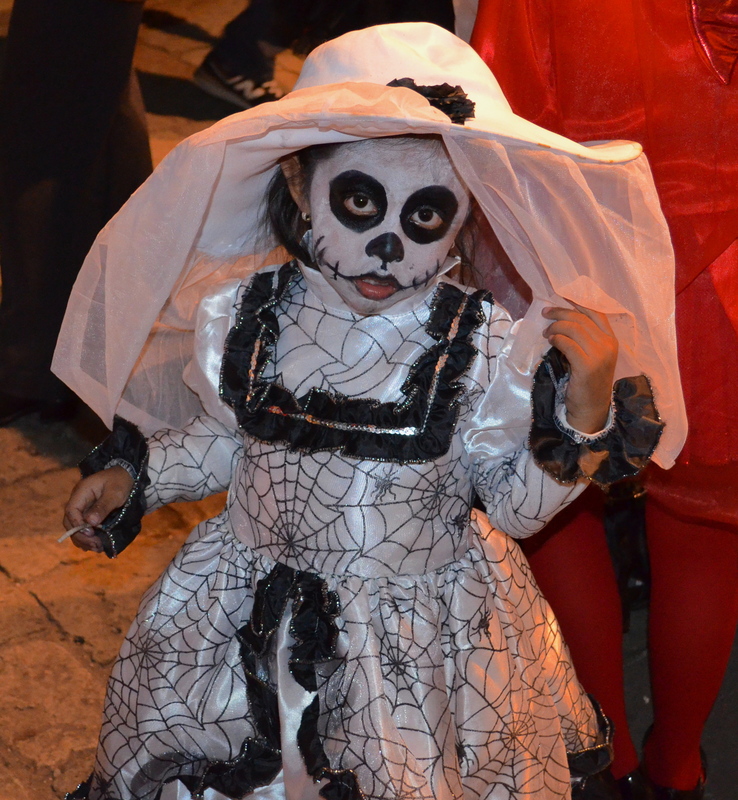 Above Left: This little Catrina was shot at night on the Alcala. I loved the way her veil lifted in the breeze and she lifts her chin to look directly at the camera. 10. 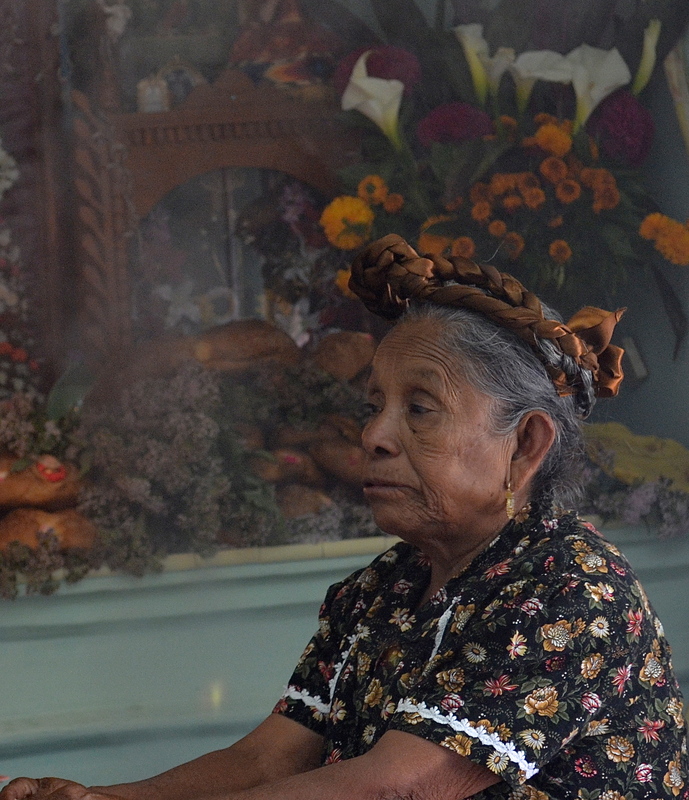 Above Right: The grandmother in a somber moment, altar in the background, after lighting the copal incense. 12. Above Left: The children’s comparsas were many and it was hard to resist the little Catrinas in their outfits. The normally shy Oaxacans were anything but shy once they donned their elaborate costumes; it seemed to transform them. 13. 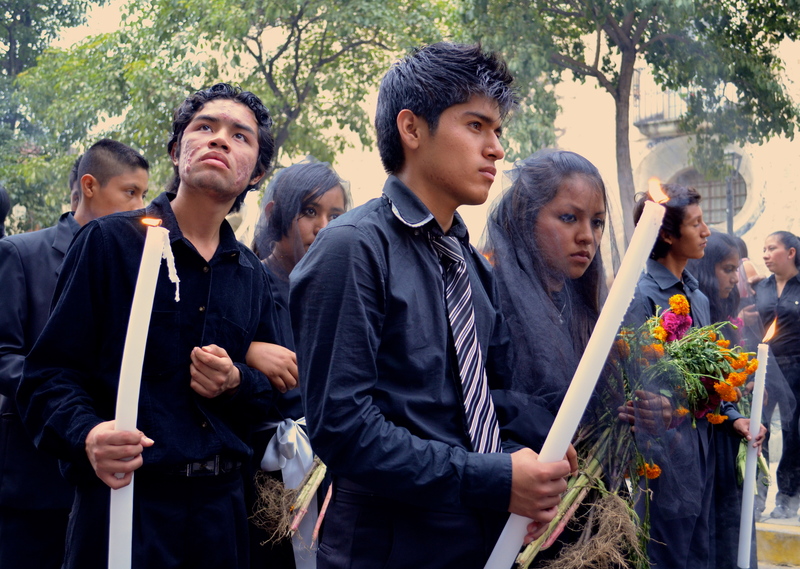 Above Right: Cemetery at Teotitlan del Valle. 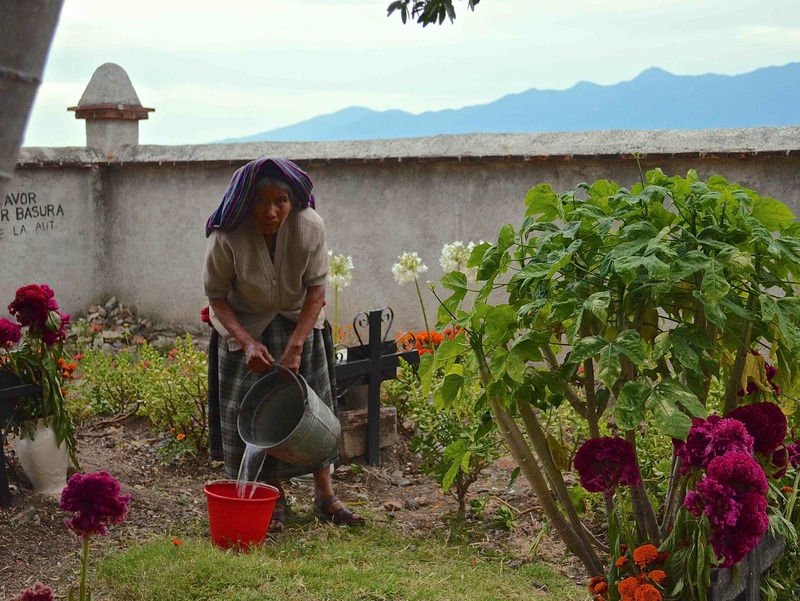 I watched as she went about drawing water from the well, cleaning and preparing the grave for Day of the Dead. 14. Left: Couple at the Textile Museum in Oaxaca. One of my favorite “postcard” shots. Helene says, “I am fascinated by ancient traditions which persist in the modern world, especially those which pertain to religious beliefs. I went to Catholic grade and high school and always loved the paintings and statues in Church. I had visited Spain for Semana Santa in 2009 and was frustrated by the limitations of my digital camera and my lack of knowledge when shooting the night processions. I shot a lot of film years ago but had gotten lazy shooting digital on automatic and wanted to change. I had been to Mexico City and San Miguel de Allende 25 years ago, loved the culture and knew I wanted to go back someday. “The structure of this expedition was flexible and provided ample opportunities for adventure and learning, both as a group and an individual. Bill and Norma’s accessibility, before and during the trip, helped make every aspect easier for me as I had a lot of questions which I emailed both of them beforehand and they answered them thoroughly. I felt totally safe and comfortable throughout. I took many of Norma’s suggestions for added excursions and they were all great, especially visiting the Rudolfo Morales museum in Octolan, Maurcio Cervantes’ art installation in Oaxaca, Mitla and the archaeological site Yagul. 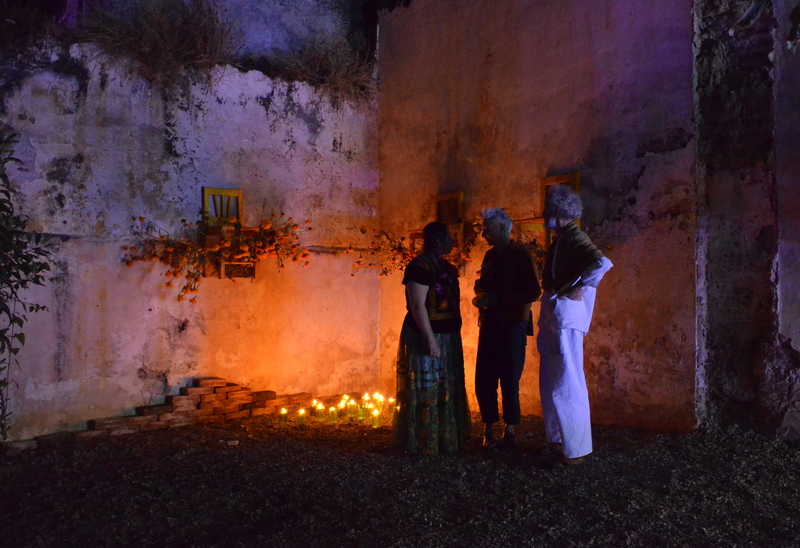 “The weaving village of Teotitlan del Valle was like going back in time, fascinating yet we all had excellent WiFi — such are the contradictions of Mexico. The bed and breakfast there was wonderful and the home cooked meals delicious. I would recommend this workshop to anyone who want to have an authentic cultural experience in Oaxaca and an excellent learning workshop at a very reasonable cost. “I enjoyed the weaving demonstration with the Chavez Santiago family and love my new rug. I was not in the market for such a purchase but really wanted to support them and their endeavors as I respect that kind of integrity and work ethic. I also loved Monte Alban, the markets–Benito Juarez and Tiacolula–watching chocolate being made, our crazy night at Xoxo, even eating a grasshopper! Helene Haviland is an independent cinematographer/camera operator whose credits include the Chris Rock Show, The Tony Awards, and the Cosby Show. She lives outside Baltimore, Maryland. And, she’s a lot of fun! This entry was posted in Cultural Commentary, Oaxaca Mexico art and culture, Photography, Travel & Tourism, Workshops and Retreats and tagged blogsherpa, day of the dead, Mexico, Oaxaca, photography. Bookmark the permalink.